Looking for something about North Carolina of which to be at least semi-proud this morning? Well, here’s something in addition to the recent performance of the Carolina Panthers: at least our ethics laws for elected officials aren’t quite as absurdly toothless as New Jersey’s. If you’re wondering why this fact as come to light in recent days, check out the story percolating through the news and sports pages about the embarrassingly troubled Governor of the Garden State, Chris “Salmon Sweater” Christie and his bizarre, make-you-cringe-and turn-away-in embarrassment bro-mance with Texas oilman and Dallas Cowboys football team owner, Jerry Jones. 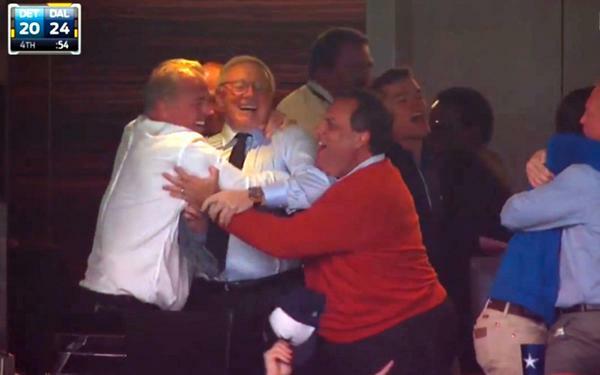 You see, Christie, the Governor of a state with two of its own NFL teams, is for some strange and probably Freudian reason, a fan of the Cowboys and has been accepting free plane rides and tickets to Jones’ luxury box for himself and his family to root on the ‘Boys at big games. (In case you missed it, click here to check out Christie’s embarrassing celebratory performance on video this past Sunday). We’re not making this up. And frankly, there would probably be a similarly vast exemption in North Carolina law were it not for the state’s brief embrace of semi-serious ethics reform in the aftermath of the Jim Black bribery scandal. 2) The next time Christie comes to North Carolina to run for national office or stump for some other candidate, we can all hope that an intrepid member of the media asks him why North Carolinians should give two hoots about the views of a man whose actions could be grounds for impeachment and even criminal prosecution in some circumstances if they had been committed by a North Carolina public official. And a third conclusion is that if such behavior isn’t clearly proscribed by North Carolina law, it sure as heck ought to be. Christie may be from New Jersey, but it looks like he’s got a little Mississippi leg hound in him.